These days, external hard drives are really cheap (as compared to their prizes year ago). Hence, backing up photos, videos, files, movies, etc. is not a big deal. However, here comes the scary part! What is the external hard drive itself crashes? After all its a mechanical device with discs in it! Hence, wise and most logical thing to do is rely on cloud storage options. 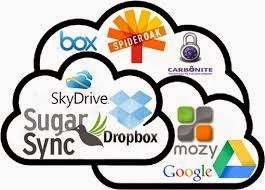 Cloud backup solutions enable individuals to store their data and computer files on the Internet using a storage service provider, rather than storing the data locally on a physical disk, such as a hard drive or tape backup. Cloud backup providers then enable their customers to remotely access the provider's services using a secure client log in application to back up files from the customer’s computers or mobile phones / tablets to the online storage server using an encrypted connection. It provides seamless sync options that ensures all devices are ready with files as required. Before we get into which are different cloud providers, there are 2 major drawbacks of opting for cloud storage service providers. 1. Hot storage - One can retrive their information (files, photos, etc.) immideatly. 2. Cold storage - One can retrive their information (files, photos, etc.) after 4 to 12 hours of the request place. To an initial storage capacity, these providers offer free storage. For instance, justCloud offers 2GB free strorage and then it starts charging. Pricing models and operation models are different for each of them but the guiding principle for all is the same. For detail comparison, visit here. But here comes an exception. What if I don't want to spend $$$. Is there a way to combine all such first free space and access it seamlessly? Answer is Yes.....there are paid and free apps that allow access to all such cloud storage from one interface. Once such example is cloudGoo. It onnects all your cloud drives with cloudGOO and act like it's all one big space. No more switching between multiple cloud accounts or apps. But then there is a limit to the first free space we get. Even if we add up all such free spaces we get, it's very difficult to cross 25GB. But, then still worth a consideration. The other option is Cold Storage. It may not give you, the required files right away - but it takes around 4 hours. Based on the Amazon Glacier technology, Zoolz introduces an interesting spin with Cold Storage; a low cost storage that is ideal for archival purposes and data that is infrequently accessed but needs to be backed up. Zoolz is a complete comprehensive storage, which makes browsing easy with its thumbnail view of all the backed up photos, instant search, and a complete list of backed up files and folders stored on Cold Storage. This saves us the time spent wondering wondering about which file was just backed up and which was not. I have a paid Zoolz account and i am loving it due to it's extremely friendly pricing. At the end, we may use an application like CloudGoo to extract free storage spaces from all hot cloud storage providers and sync. frequently used files (mainly images and videos) while we can use a paid cold storage provider like Zoolz for storing infrequently used files.